Dining on Caribbean Princess runs from just OK to really quite good, with the best dishes served in the specialty restaurants (Crown Grill gets the highest marks) and at the $95-per-person Chef's Table. The World Fresh Marketplace runs hot and cold; our favorite dish on the entire ship was a simple quinoa with caramelized onion side offered one night in the Marketplace, but on other nights we couldn't find anything that appealed to our taste buds. The main dining room always satisfied. One of the best things about dining on Caribbean Princess is the plethora of choices for any meal with five venues open for breakfast, seven for lunch (five on a port day) and eight for dinner. Most dietary restrictions can be catered for if you alert the line to your needs before you cruise. Even if you forget to tell them, there are always vegetarian options, gluten-free bread and sugar-free choices at dessert, and if you talk to the maitre d' once onboard, you can arrange special needs meals for each day. Island and Coral Dining Rooms (Decks 5 and 6, midship): Caribbean Princess has three main dining rooms, one of which is reserved only for suite and Club Class mini-suite passengers. The Island and Coral dining rooms are for everyone else. Breakfast, afternoon tea and dinner are served every day in one of the dining rooms; on sea days, lunch is also served in one of the restaurants. Breakfast in the main dining room features two menu items that change daily and a full list of standards available every day. On sea days, lunch is served in one of the two dining rooms from about noon to 1:30 p.m. The menu includes brunch selections, as well as starters, soup, salad, pasta, entrees, burgers, combos (soup and salad, or soup and a sandwich) and desserts. Desserts are varied and delicious. Afternoon tea, served every day from 3 to 4 p.m. consists of finger sandwiches, pastries and cookies and a selection of teas. The dinner menu most nights includes a changing menu of starters, soups and salads, mains and desserts. Items listed under Princess Favorites are available every night. Vegetarian options are marked with a "V."
Some nights the menu also features a "Crafted by Curtis Stone" item, brought to Princess by its partnership with celebrity chef Curtis Stone. Choices might include seafood stew with Chilean sea bass, black mussels and clams, or chicken and leek potpie. Desserts also include a selection of always-available items and nightly specials. On rare evenings, a Chocolate Journeys option (created in partnership with chocolatier Norman Love) is available as well. The one we encountered was a chocolate pistachio dome with almond and pistachio nougatine; it got rave reviews. Palm Dining Room (Deck 6, aft): The Palm Dining Room is an exclusive main dining room reserved only for passengers staying in suites and Club-designated mini-suites. It uses the same menus found in the Island and Coral dining rooms. Seating in Palm is set seating only, with early dinner at 5:45 p.m. and late dinner at 8 p.m.
World Fresh Marketplace (Deck 15, midship): Essentially the ship's upper-deck buffet, World Fresh Marketplace is a conglomerate of food stations designed to decrease congestion and move cruisers through the buffet more quickly. The U-shaped space is located between the midship Calypso Pool and the aft Planks BBQ and Steamers Seafood restaurants. There are identical setups on either side of the Marketplace, each with three rows totaling about 15 themed stations that change from lunch to dinner, though some -- such as Eastern and Western Destinations, the Garden Soup Kettle and the two Pastry Counters -- are always there. It can be a noisy spot, and seats during peak times (embarkation day, sea day breakfast and lunch) are hard to come by. If you can't find a place to sit at lunch, you can head to the back and sit in Steamers or Planks BBQ or try to find one of the few tables located outside by the pools. World Fresh Marketplace is open for breakfast, lunch and dinner, offering food throughout the day. At breakfast you'll find all the usual morning offerings, while lunch offers Indian, Middle Eastern, Italian and Mexican dishes; a carvery, soups and sandwiches; prepared and DIY salad fixings and more. Dinner selections are similar though smaller in number, plus a Family Kitchen island with items like corn dogs, pasta with marinara or Alfredo sauce, and French fries. Only one side of the buffet is open for dinner most nights. At the two Pastry Counters, you'll find a selection of cakes, cookies, brownies and other dessert favorites at both lunch and dinner. The nearby "Specialty Shop" has a selection of gluten-free desserts (a real rarity!). The Salty Dog Grill (Deck 15, midship): A poolside grill with gourmet ambitions, The Salty Dog Grill features items like the triple smoked burger with hickory-smoked bacon jam, smoked Gouda and barbecue onion sauce; a grilled chicken sandwich with dill and lemon aioli, cucumber and tomato; and two flavors of "street tacos." The star menu item is the extra-fee Ernesto burger, which was created by Los Angeles-based chef Ernesto Uchimura specifically for Princess Cruises. The Ernesto features fresh ground rib-eye and short rib patty with grilled pork belly, aged Gruyere, caramelized kimchi, beer-battered jalapeno and charred onion aioli. If you're just looking for more traditional poolside grill options, the closest item on the menu is the Princess Classic burger with tomato, lettuce and red onion, plus a choice of cheese. There is no plain hot dog though; instead The Salty Dog Grill serves an all-beef sausage-like hot dog, with your choice of toppings, and the "Salty" chili cheese dog. Sides on offer are loaded fries with either chili cheese or bacon and cheese. Veggie burgers aren't available. Slice Pizzeria (Deck 15, midship): Also located poolside is Slice Pizzeria, with both standard and more trendy options. Gluten-free versions of the thin-crust pizza are available upon request. Coffee & Cones (Deck 15, midship): Most of the items at this specialty coffee and ice cream shop cost extra, but you can get free soft serve vanilla and chocolate ice cream in a cup or cone. Complimentary extras include sprinkles and whipped cream. British-Style Pub Lunch (Crown Grill, Deck 6, forward): On sea days, you'll find a British-style pub lunch on the lineup of the day's activities. Open for about two hours (usually from 11:30 a.m. to 1:30 p.m.), the menu has just four items on it: bangers (sausage) and mash, fish and chips, ploughman's lunch and steak and kidney pie. The only dessert provided is a bread and butter pudding. For aficionados of British or Irish pub food, the offerings at this Princess staple might disappoint, but we enjoyed our fish and chips, nevertheless. The International Cafe (Deck 5, midship): Light bites, including a delicious selection of pastries, plus coffee and tea (basic and for-a-fee specialties) are available 24 hours a day at this popular spot in the Piazza. During the early hours, the selections at The International Cafe are more breakfast oriented, but as lunch approaches, breakfast pastries give way to a variety of cakes, flavored puddings and fruit tarts. At least two choices are sugar-free. More substantial snacks are also available from late morning to late afternoon, including a hearty selection of sandwiches, steak and kidney pie, quiches, salads and a soup of the day. Room Service: The Princess room service menu is comprehensive, complimentary and available 24 hours a day. It includes soups, salads and sandwiches, as well as a selection of hot dishes and pastry items. Additionally, select drinks and a limited selection of food items are available through the OceanNow app (you'll have to have downloaded the app to your phone before your cruise), for delivery to select locations throughout the ship. There is no charge for the service, above and beyond the cost of any items you are ordering. Options include free choices, as well as those that cost money. Crown Grill (Deck 6, forward); $29 per adult and $14.50 for children ages 3 to 12: Princess' most popular specialty restaurant is its steakhouse, the Crown Grill, with a menu consisting of seafood entrees and chops. Crown Grill is only open for dinner, though on sea days the British-style pub lunch is held here. Starters are black tiger prawn, carpaccio of pine nut-coated lamb loin, Mediterranean-style spiny lobster cake and pan-seared Pacific scallops. Soup and salad choices are shrimp and pancetta bisque, black and blue onion soup, mixed salad and a marinated goat cheese and heirloom tomato salad. Diners in the mood for seafood can choose a mussel pot, Chilean sea bass and brioche-breaded king prawns, grilled tiger prawns or a 4-ounce lobster tail (add the lobster tail to one of the meat entrees to create your own surf and turf dish). But what the restaurant is known for are its steaks and chops, which include Sterling Silver beef chop, Madeira-glazed Wisconsin veal chop, New Zealand double lamb chops, Sterling Silver pork chop, porterhouse, New York or Kansas City strip steak, rib-eye and filet mignon. Side dishes (order as many as you want) are delicious. Try to leave room for desert, as the choices are ultra-indulgent. 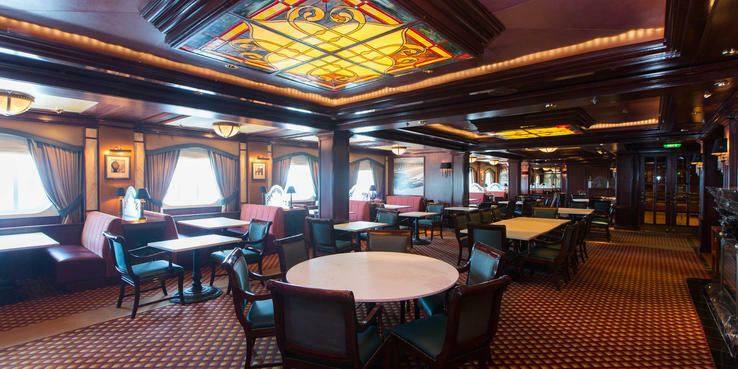 Sabatini's (Deck 7, midship); $25: A longtime Princess favorite, Sabatini's underwent a complete overhaul in 2017 that included scrapping the old menu and replacing it with an entirely new one created in partnership with Los Angeles-based chef Angelo Auriana. The menu consists of five courses (diners choose one item for each course), plus the aperitivo, which features warm mini-whole wheat loafs, a Tuscan tomato and pepper spread and prosciutto. Your waiter will help you through the menu because the order of the dishes can be a bit confusing. First is the antipasti; the five choices all have Italian names with the English explanation below. As a second course, you can choose either a celery, mushroom and hazelnut soup or an escarole, celery and pear salad. Second and third courses are the pasta and main entrees. There are six main entree choices including trout rolls, breaded veal with potatoes and artichokes, rolled pork belly Toscana and the Roman seafood al cartoccio with grouper, shrimp, black mussels, scallops, potato and artichoke. If you can't decide on just one pasta or entree, you can pay $10 for each additional choice. The menu consists of two starters and three entree choices: black and blue mussels with scallops and kielbasa sausage; steamed clams with shrimp and andouille sausage with a choice of three sauces; the "Princess Broiler," which comes served in a large skillet pan and includes broiled scallops and shrimp, and the crab-stuffed flounder, with a side of crispy seasoned fries. Diners can opt to add lobster tail and crab to any of the entrees for just $10. Dessert choices are limited to just three items. Also on the menu at Steamers Seafood are specialty cocktails with names like Mermaid's Wish and Captain's Bounty. Chef's Table (Deck 5, midship); $95: The most exclusive dining event on Caribbean Princess is the multicourse Chef's Table with wine pairing, which takes diners behind the scenes into the galley for hors d'oeuvres and Champagne and then to a beautifully appointed table (either in a main dining room or a private room) for the lavish meal. The meal changes each time depending on the mood of the chef. Special diets will not be accommodated; diners should be up for just about anything. Chef's Table is offered once or twice per cruise depending on cruise length and fills up almost as soon as it's announced in the daily Princess Patter. Also, to participate in Chef's Table, diners are required to sign a document that says they have not had any gastrointestinal or respiratory illness within the last 48 hours, wear a white lab coat-like jacket while in the galley and not wear shorts or open-toed shoes. Planks BBQ (Deck 15, aft); $12: The only complaint we heard about this meat-lover's paradise was that it served way too much (good!) food. A casual dinner-only eatery, Planks BBQ features round or block wood tables adorned with blue masonry jars and paired with silver-studded leather backed chairs. Three courses are included in a Planks meal: appetizer, main course and dessert. Along with the meat, each plank also has a "heaping" serving of sides. Sauces -- tangy apple butter and cider, and steakhouse smoky bourbon and ale -- are served on the side and you can always ask for more. For those who have room for more, desert choices are banana pudding, chocolate cake or a scoop of vanilla or chocolate ice cream. Be prepared to unbutton the top button of your pants when all is said and done. Coffee and Cones (Deck 15, midship); a la carte: Other than the soft serve ice cream, everything at Coffee and Cones carries a surcharge. But $3 is a small price to pay for the delicious ice cream sandwiches you'll find on offer. Our favorite was the mint patty with peppermint ice cream nestled between two chocolate chocolate-chip cookies. Also available are specialty coffees (hot or cold). Ultimate Balcony Dining (Your Cabin); $45 for breakfast per couple and $100 for dinner per couple: The fanciest room service on your balcony you're likely to encounter at sea, two Ultimate Balcony Dining options are offered on Caribbean Princess (and you must have a balcony to order them). The first, the Deluxe Breakfast, can be served from 7 to 11 a.m. and includes a chilled half-bottle of sparkling wine, fresh breakfast pastries, smoked salmon with dill cream cheese, a medley of fresh fruits and berries, and quiche Lorraine. The four-course Deluxe Dinner is available from 5:30 to 10 p.m. and features pre-dinner cocktails (one per person), four canapes per person and a half-bottle of chilled sparkling wine. Dinner itself can consist of items from a set menu, the evening's main dining room menu or a special request. An extravagant dessert is also included. Vines (Deck 5, midship); a la carte: The ship's wine bar offers tapas-style snacks when you buy a glass of wine. Food cannot be purchased separately from the wine, nor can you get food if you want something nonalcoholic.